It’s all about accountability. When your whole team feels accountable for the success of the business, magic can happen. This book will leave you in no doubt that a culture of accountability can bring game-changing results. This is a practical guide to get you there with proven case studies to keep you inspired. The feeling of accountability can make an employee feel like they are part of something bigger. They don’t just go through the motions, they think creatively, go the extra mile and work better as a team. Research tells us time and time again that the feeling of ‘purpose’ is a critical factor for employee engagement. And for me, purpose and accountability go hand in hand. 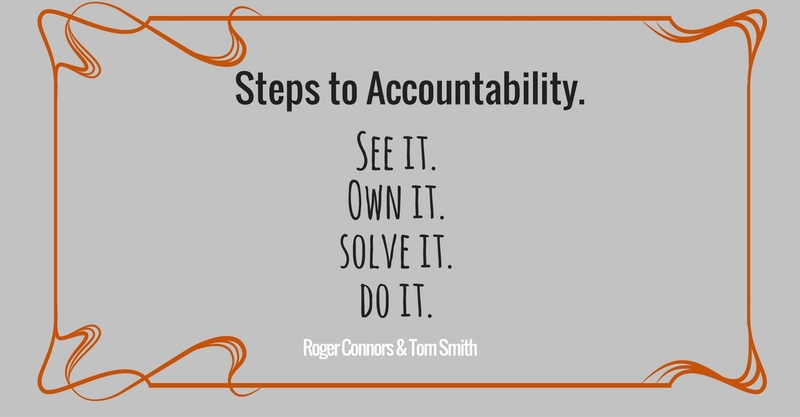 Roger Connors and Tom Smith believe that ‘the most effective culture is a culture of accountability’. And they know a thing or two about it. 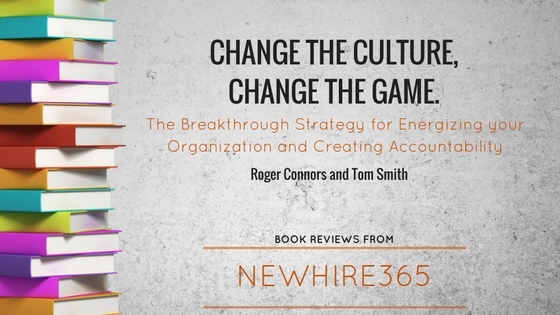 Change the Culture, Change the Game follows on from their classic books ‘The Oz Principle Series’ and ‘How did that happen’ and completes the series that many believe is the most comprehensive series ever written about workplace accountability. As well as being two time ‘New York Bestseller’ authors, they are co-founders of Partners in Leadership, a management consulting firm with hundreds of customers. Every day managers create experiences that shape the culture of the organisation. These could be the way failure is dealt with, who is promoted, the policies and procedures that are set up. These experiences create belief – ‘that’s how we do things around here’. The belief influences the actions employees take. And the type of action taken determines the results of the company. The book talks about a Results Pyramid which shows how experiences, belief and actions work harmoniously together to produce your results. Experience, beliefs and actions are what make up your culture. The book features an example of a company, Alaris, who were steadily heading towards bankruptcy. They had spent months focussing on improvements to the financial performance and failing. The leader then moved his attention to improving the culture, using this model, and the turnaround was astounding. In a culture of accountability people ‘step forward and work hard to solve problems and get results’ And they do this willingly. They work ‘above the line’ which means that they follow the steps of accountability – see it, own it, solve it, do it. And they feel able to do this because their company has created an environment – based on the Results Pyramid mentioned above. They are transparent, honest, considerate. This is in contrast to those that work ‘below the line’ that thrive in a blame culture where pointing fingers and not taking responsibility is the norm. People can either act above the line or below the line. The skill to lead change. You can’t just delegate responsibility to HR or a Head of Culture. You need to understand fully what is going on with the change at every level. The skill to respond back. Not everyone is going to be delighted with what is going on. There are five steps to take to make sure everyone is aligned. The skill to facilitate. For change to succeed you need to encourage dialogue and collaboration. You may successfully implement a culture but it can be hard to sustain it. To do this you need to look at all the systems, processes and procedures in your business today and see how you can integrate the elements of the culture change into these. Otherwise your employees will be trying to move forward in the new culture but the old ways of working may slow them down or stall their progress. To the business leader who is thinking ‘where on earth do I start’. Or the leader that has tried other ways of turning a business around, and hasn’t seen the results. I would also recommend this for departmental managers as there is great advice here for getting results out of teams. You don’t need to run the whole organisation to get many takeaways from this book.